(4538, Sturm's Magazine Collection, OHS). (4705, Oklahoma Historical Society Photograph Collection, OHS). As the county seat of Hughes County, Holdenville is situated at the intersection of State Highway 48 and U.S. Highway 270, approximately seventy-five miles southeast of Oklahoma City. Originally located in the Creek Nation, Indian Territory, a settlement known as Echo (a Creek word meaning "deer") existed before the arrival of the railroad. Echo became known as Fentress with the establishment of a post office on May 24, 1895. George B. Roderick operated a small store there. In 1895 the Choctaw, Oklahoma and Gulf Railroad (CO&G, later the Chicago, Rock Island and Pacific Railway) built a line from McAlester to Oklahoma City. As a result, Holdenville was surveyed on September 19, 1895, on land that belonged to Frank Jacobs, his son John Jacobs, and Charlie Grayson. On November 15, 1895, the Fentress post office was renamed Holdenville, in honor of J. F. Holden, an employee of the CO&G. 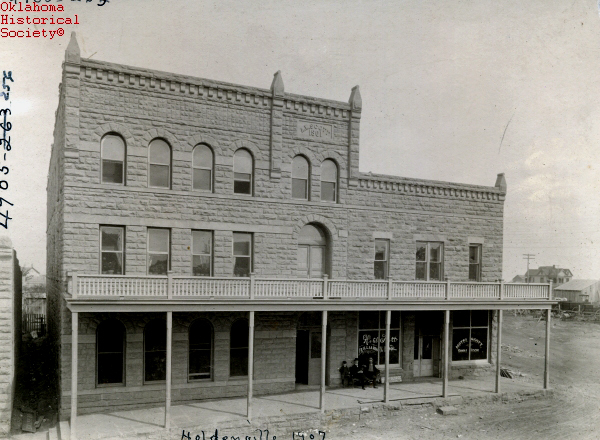 On November 14, 1898, Holdenville was incorporated as a town by an order of the U.S. District Court at Muskogee. At the first municipal election held on December 27, 1898, D. J. Red was elected mayor. 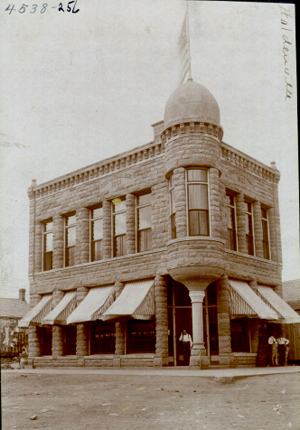 The first city council meeting was held on January 4, 1899. When the St. Louis, Oklahoma and Southern Railway (later the St. Louis and San Francisco Railway) constructed a line between 1900 and 1901 from Sapulpa to the Red River, it passed through Holdenville. At that time it had a population of 749. By 1907 citizens supported three newspapers, the Holdenville Times, the Holdenville Tribune, and the Union Signal. Two years later the settlement had developed as an agricultural trade center and boasted five banks, three cotton gins, four lumberyards, and a cottonseed oil mill. Joseph Sondheimer, a Muskogee entrepreneur, had a sales outlet for his hides and furs there. His sons took over the business after his death in 1913. In the 1930s five cotton gins and two grain elevators operated. As the Greater Seminole and Hughes County oil fields developed in the 1920s and 1930s, numerous petroleum companies located in Holdenville. Education assumed a prominent place in community life. In 1896 a Mrs. E. C. Roberts established a subscription school in a one-room frame building. The city government issued a ten-thousand-dollar bond to erect a school building in 1904. In that year eight teachers taught 514 students for an eight-month term. In the 1930s the local public school system included three elementary schools and junior and senior high schools. African American children attended segregated schools. In 1933 junior college-level courses were offered at the high school. A private business college was in operation in the 1930s. In addition to education, religion held a prominent place in residents' lives. Early settlers organized Methodist, Baptist, First Christian, and Episcopal churches. In the 1930s and 1940s fifteen churches represented thirteen denominations. On June 27, 1908, Holdenville, Wetumka, Calvin, and Lamar competed for the privilege of becoming the permanent county seat. Because none received a majority, a runoff election between Holdenville and Wetumka was held on September 10, 1908, with Holdenville the victor. County officials had offices in the federal courthouse, but in 1920–21 a new courthouse was designed by Layton, Wemyss Smith, and Forsyth and built by Manhattan Construction Company. Forty-four years later, in January 1965 a modern courthouse was completed at a cost of $450,000. A public library, sponsored by the Business and Professional Women's Club, opened on September 27, 1929. In the 1980s former resident T. Boone Pickens donated funds for the building's expansion, and the facility was renamed Grace M. Pickens Public Library in honor of his mother. At the time of the library's opening, other city amenities included two parks, one sponsored by the Holdenville Rotary Club and the other known as Stroup Park, in honor of Bertha Stroup, who had donated the land. The parks offered playground equipment and wading pools for children as well as tennis courts and a swimming pool. Holdenville's economy has been primarily based on agriculture. The main crops have included cotton, peanuts, pecans, corn, hay, and oats. Farmers have also grown sweet and Irish potatoes and orchard fruits. In addition to agriculture, the economy has been augmented by various businesses. Through the years the Covey Corporation manufactured plastic products and employed approximately one hundred fifty workers. Other enterprises included Seamprufe Corporation, which manufactured lingerie, and F. B. Fly Company, which made fishing tackle. Aquafarms, a catfish processing plant, and the Holdenville State Fish Hatchery also provided employment. In the 1990s Tyson Foods' hog breeding operation and the Earl A. Davis Community Work Center created jobs. At 1907 statehood Holdenville had a population of 1,868. The census continued to climb to 2,296 in 1910 and 2,932 in 1920, peaking at 7,268 in 1930 due to the oil boom. Population declined to 6,632 in 1940 and continued a downward spiral to 5,181 in 1970. The 1980 and 1990 censuses reported 5,469 and 4,792, respectively. At the turn of the twenty-first century Holdenville's amenities included city parks, tennis courts, golf courses, a hospital, and a municipal airport. Since May 1934 nearby Lake Holdenville has offered outdoor recreational activities. Children received an education at three elementary schools, one junior high school, and two high schools. With an aldermanic form of town government, Holdenville had a population of 4,732 in 2000. The 2010 census counted 5,771 inhabitants. Among the properties listed in the National Register of Historic Places were the Holdenville National Guard Armory (NR 88001386), the Holdenville City Hall (NR 81000463), the Moss School Gymnasium (NR 88001388), the John E. Turner House (NR 83002090), and the Stroup Park Swimming Pool and Bath House (NR 88001387). Fran Cook, "ACHO" Flower of the Prairie: A History of Holdenville, Oklahoma and Hughes County (Holdenville, Okla.: N.p., ). "Holdenville," Vertical File, Research Division, Oklahoma Historical Society, Oklahoma City. Profiles of America, Vol. 2 (2d ed. ; Millerton, N.Y.: Grey House Publishing Co., 2003). Linda D. Wilson, "Holdenville," The Encyclopedia of Oklahoma History and Culture, https://www.okhistory.org/publications/enc/entry.php?entry=HO011.